Check out the older game version for the Hogwarts House Sorting Quiz! 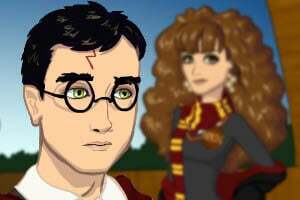 More than just a Harry Potter dress up game, you can create infinite characters, and arrange them in a magical scene. You should have all the features necessary to create Harry, Ron, Hermione, Ginny, Bellatrix, Snape and even Voldemort's slit-like nose! In addition to the usual hallway, quidditch pitch and Snape's office backgrounds, this game also has a common room and Quidditch stands. You can dress up in clothes from all four houses (Gryffindor, Slytherin, Ravenclaw, Hufflepuff), and even Death Eater-specifics like masks and dark marks. You can even show your characters casting spells! I would love a remake! :D I love this one though! How do you get the knee guards off? Me too @HarryPotterFan6! I love this game, and Harry Potter! I'd like to see a remake. WE KNOWS WHO *tries not to say his name* V-V-V *says his name* VOLDERMORT NOSE *looks around* I said his name, is that problem?